Maybe it’s just because I’m a bit of a geek at heart, but I’ve always tried to measure my performance in races based on the rest of the field. 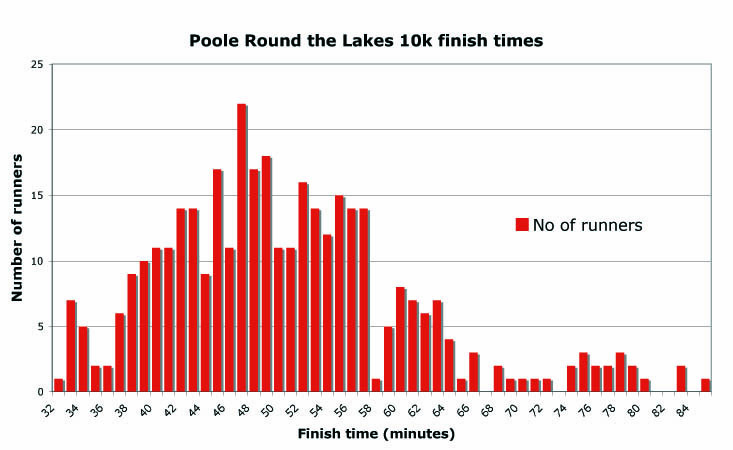 Generally, when I’m running well I’m in the top 10 per cent of finishers (for example, the Andy Reading 10k), and when I’m running not so well, I’m in the top 15 per cent (such as the recent running-while-ill extravaganza of Poole Round the Lakes 10k). This, and perhaps having a little too much time on my hands during the tail end of the holiday season, led me to think about where ‘the curve’ lies on different races. (Essentially, the peak of the curve represents the mode finishing time – i.e. the finishing time with the most runners.) Of course, it all depends a little on the strength of the field (you would expect a strong field to produce a peak closer to the winning time than, say, a fun run field), and the difficulty of the course. So, I took the finishing times for two quite different races and thought I’d see what came out of it. You should note that this doesn’t take account of gender or age, thus grouping all the different categories into one. This may well skew the curve slightly, depending on the gender and age breakdown of the field. This is a pancake-flat course – literally, the highest climb is a curb – and consequently has the potential to be very fast. The race report is here, if you want a bit more detail about the kind of race. In this instance, a finishing time in the 48-minute bracket was the mode. Normally, you would expect the first finisher to be an outlier (i.e. well ahead of the curve, with a flatter taper into the main body of the curve), but there were obviously some strong runners in the chasing pack. 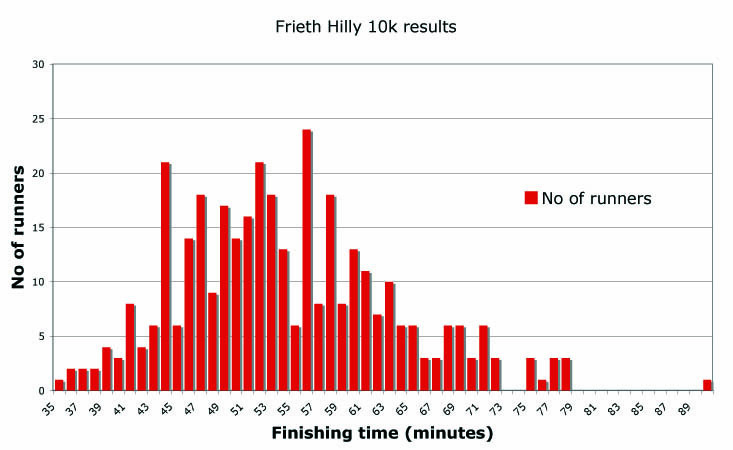 The Frieth Hill 10k is a fairly tough multi-terrain race with plenty of undulations, including some steep inclines and declines. Again, the race report is here if you want some more detail on the kind of terrain it covered. Because this race covered some tough ground and included a relatively mixed field (it attracted some strong club runners, but also a lot of fun runners) there is a more gradual overall trend to the curve. The mode finishing time was in the 57-minute bracket, although there are similar-sized peaks at 45 and 53. So, here’s to a year of being ahead of the curve!